Dan Larimer theorised that EOS Block Producers would one day end up becoming professional entities like universities, exchanges and data centres. Universities were at the forefront of the technology that gave us unprecedented access to information…the internet. We at EOSphere believe that universities can be instrumental in integrating the blockchain revolution into mainstream society as well. By giving the next generation direct unconstrained access to study this technology, we are able to move adoption from the fringes to the heart of society. This however is not where it stops… EOSphere understand that EOS is something more than just a revolution in token economics and DApps. It is also the first blockchain to deploy a full governance layer and is the first blockchain with the potential to update and change the way we view governance as a society. Academics have long studied and researched alternative governance models but with nowhere to put the theory into practice. It’s not a simple process to get nation states to update their governance models, nor is it any easier or likely to create a new nation to put these ideas into service. EOS however gives the world access to a new medium to do this. This technology is a lot bigger than just speculation. It is community…and not just DApp community building, but potentially a new way to view governance in society as a whole. This may one day have the power to transcend the capabilities of nation states and help the world march full steam towards true globalisation. This is why EOSphere have partnered with RMIT University. We have pledge to use block rewards to fund the RMIT EOS Research Foundation. A foundation fully devoted towards the research of governance and blockchain as one entity. We have also further pledged to share this academic research with the entire community and be an instrumental role in helping EOS reach its FULL POTENTIAL. The beauty of acting as a fully global community is we can all bring our strengths to the table. The wisdom and strategic brilliance of the East with the bold tenacity of the West. Australia is perfectly positioned to deliver an independent mix between all the cultures of the world and is itself a nation made up of multiculturalism. 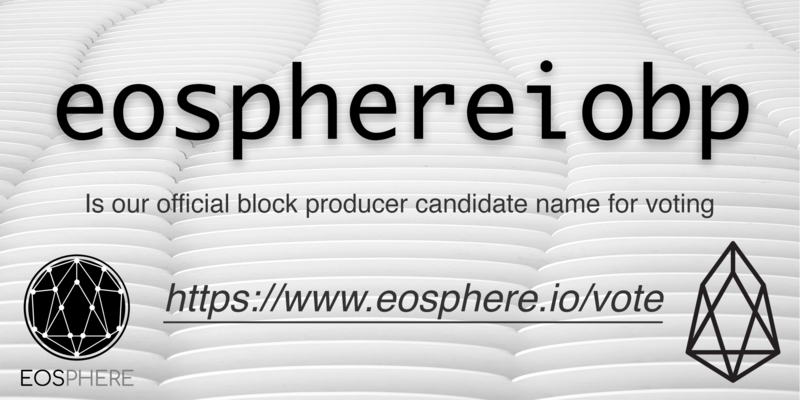 There are a large amount of very capable Block Producers already working towards building the DApp community us included… However let EOSphere and RMIT help take its governance potential to the next level. A vote for EOSphere is a vote for governance and a vote towards political freedom! How awesome is it when two of your supported dApps and Services partner for the advancement of tokenisation, leasing and trading on the #EOSIO platform!